I’m combining this week’s Photo Friday theme of travel with the cake-themed celebration for the 300th (200th) Stirrup Queens Friday Blog Roundup. Happy Birthday, Roundup! Here is a photo of a cake seen in my many travels. When I travel, I absolutely see all of the sights and museums that each place has to offer, but I also seek out the local yummies. Some people might explore bars or restaurants, but you’ll find me in the bakeries and sweet shops of the world. This cake is actually not one that I tried, nor would I ever eat it, because I don’t like cheesecake, but oh it is beautiful. A lot of love obviously went into arranging those strawberries. Since I didn’t eat it, I can’t tell you whether “Strawberry Cheesecake” refers only to the fruit on top or to any flavoring within the cake. 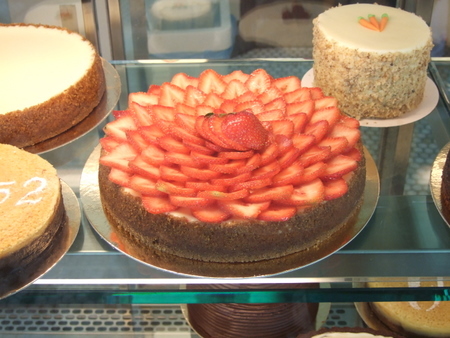 Perhaps you’d like to go to this fine bakery in this lovely city and taste for yourself. Let’s play a game. Want to guess where in the world I found it? Now I need to go finish packing for New York! First stop, Dora and Sunshine. Then, the post-BlogHer ALI meetup.